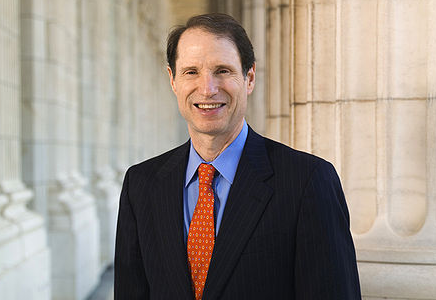 Judging by the color scheme Sen. Ron Wyden, D-Oregon, chose for the photograph featured on his official senate web page, he actually might enjoy it. Sen. Ron Wyden, D-Oregon, is about to eat a little crow by wearing a little tie. The senior senator from the Beaver State plans to own up to a bet lost to Sen. Jeff Session, R-Alabama, by wearing an Auburn-colored tie at tonight’s State of the Union address. The wager was made after Wyden, wearing a green and gold striped tie, engaged in some trash during a during a Senate Budget Committee the Friday before the BCS National Championship Game. “I do want to note for the record that I don’t believe the Auburn Tigers have a realistic chance of keeping up with the University of Oregon’s fast-moving, innovative offense in the championship game,” Wyden said. Judging by the color scheme he chose for the photograph featured on his official senate web page, Wyden might actually enjoy making good on the bet, which Fox News host Greta Van Susteren dedicated a post to on her website. We just hope he doesn’t wimp out like Robert Gibbs. Robert Gibbs backed off of the plan to roll a tree at the white house in light of the shootings in Arizona. I think this was a class move on Gibbs part. You may be right, GM, but that wasn’t listed as a reason in the article, at least the one we saw.